Although Otto is approx. 6 years old he is actually very immature. He was rescued from a high kill shelter in Romania and was then placed in a compound where he stayed until a rescue was found. Otto does not like you grabbing hold of his collar/neck area, he will react to this and will grab hold of the person doing this. We can only assume that his fear of this is down to him being caught by the dog catchers (when in Romania) who we know use brute force and a catch pole to capture the dogs. We understand him much more now and continue to work to help desensitise him. 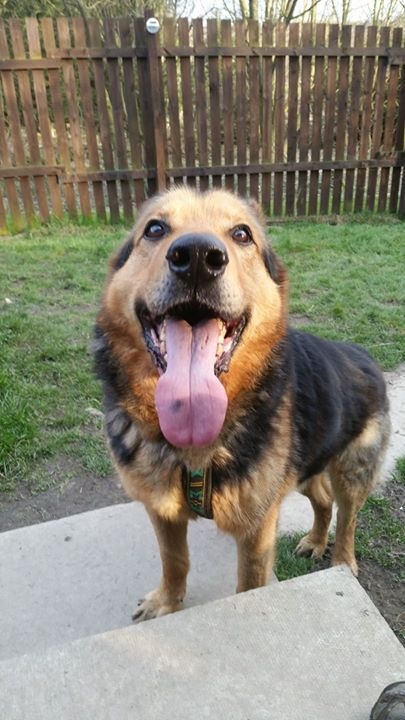 Otto has been with us a while now and although in kennels, he does get out and about every day. He is a strong dog, yet not reactive and just seems to love going out for long walks and seeing the big outside world. He will now travel ok in a car/van, he has been on several group walks with other dogs and is very well behaved. We’re not sure if Otto has ever been in a home, but I’m sure with an understanding and experienced owner he won’t be a problem. You can’t force or put pressure on Otto, he needs to trust you first and then he is happy. Otto is looking for a very experienced home, someone who will take their time and not rush or push Otto into doing anything he is unsure of. We would not place Otto with Children as no history and how he can grab when he feels very unsure. If you are interested in adopting Otto, then a few meets are essential for you both to get to know and understand each other.